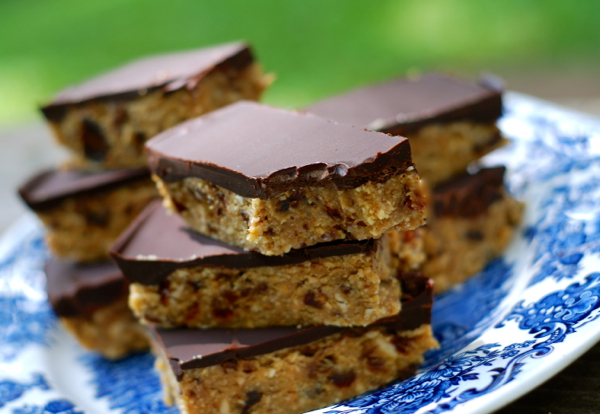 This recipe is loosely adapted from Gwyneth Paltrow’s recipe for healthy candy bars that I discovered in her awesome book, It’s All Good. Her original recipe calls for 1/2 cup shredded coconut in addition to the rest of the ingredients, and I opted to omit it. She adds coconut oil to the chocolate topping, and I didn’t. I sometimes make these with peanut butter instead of almond butter, and I always use vanilla extract instead of almond extract for this recipe. She also forms the bars on a parchment paper-lined sheet pan, and I just pressed mine into a 9×9, square cake pan. The bars are great both ways! Have fun experimenting. These are so delicious, and very good for you, in moderation. Grind the cashews to a very fine meal in the bowl of a food processor or blender. Pour it into a large mixing bowl, along with the chopped dates, almond/peanut butter, maple syrup, coconut flour, shredded coconut (if using,) and flavor extract. Mix well until you have a sticky ball of dough. Press evenly into a 9×9 glass cake pan. Refrigerate for 8 hours, until firm. Once bars have chilled for 8 hours, place the chocolate chips in a microwave-safe bowl. Microwave in 15 second bursts, stirring in between sessions, until just melted and smooth. Pour over the chilled bars and smooth into an even layer using a rubber spatula. Place in the refrigerator and chill until chocolate is completely set and firm (at least one hour.) Cut into 12-18 bars. Serve at once or store in an airtight container.